Radio Connection student Callan McClurg has got a personal motto: “If you work hard, good things will happen.” Look closer and you’ll see Callan’s most definitely working hard but he’s also doing a couple of other key things right. He’s constantly connecting with the world i.e. the players and industry people he’s building relationships with, and he’s always appreciative of the opportunities that come his way! Just weeks later, thanks again to what he calls “the wonders of social media,” Callan nabbed another LA Sparks Player for an interview, this time resident San Diegan, guard Candice Wiggins. And what does Callan have to say? He calls it “the best hour and three minutes of my career spent.” This time around, Callan got really in-depth, offering a forum for Wiggins to share “the stories she had to tell of her relationship with Tony Gwynn … her heart-to-heart conversation with Pat Summit, the story of her father and his professional baseball career” and they also talked about what she sees herself doing in the future. 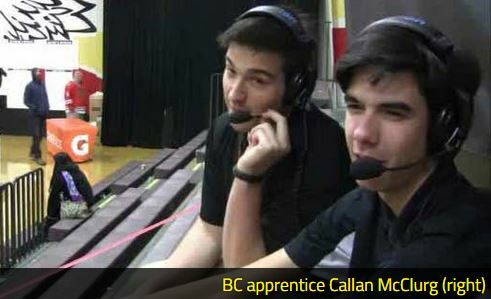 Callan McClurg is using every possible approach to build his career in broadcasting. When he isn’t in-studio apprenticing with his mentor, Chris Torrick at Mountain Country in Alpine, California, he’s connecting with players via Twitter, Instagram, Facebook and he’s airing his interviews on YouTube. When he isn’t doing that, he’s writing his blog and did we mention, yes, Callan’s already on-the-air in San Diego! Check him out, Tuesdays on Steve Dolan’s Dugout on 107.9, from 6-7 pm!